Medelita has re-designed scrub pants with their customers in mind. The waistband of the scrub pants has two parts: an elastic back (made with non-latex rubber so as to not trigger any latex allergies) and a drawstring tie. This dual waistband is perfect because the drawstring allows you to tighten the waist, while the elastic allows enough give for the pants to stay extremely comfortable. These scrubs are extremely soft, durable, and come in a variety of colors that are popular among all medical professionals. 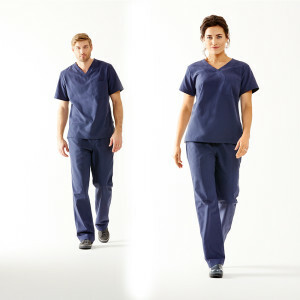 Because of the fabric finish and updated cut, Medelita scrubs are definitely the best on the market for looking professional, but they’re also impossible to beat in terms of functional features. Don’t forget, they also come in styles for both men and women! This entry was posted in Medical Scrubs and tagged Performance Features, Scrubs Pants on May 2, 2016 by Ariel Jacoby.